A controversial neuroscience study was published recently purporting to show that men and women have different brains. The research – according to the popular media – “proved” that the brains of men and women are wired differently. The problem is, the study “proves” no such thing. What the study discovered was that when the brains of young people aged 8 to 22 are scanned, there does appear to be some difference between the way that things are connected. Yet this doesn’t mean that men and women ARE different. It is a chicken and egg question, really. Do we get different brain scans from men and women because of biological differences? Or do the differences in the scans arise because we treat those brains differently from birth? In other words, are those differences nature or nurture? The popular press would have us believe it is all natural, that men and women are different. But when you look at the details of the study and consider other factors, it isn’t so clear. For a start, there were no real differences until about the mid-teens. Younger children did not demonstrate these brain differences. That suggests a potential hormonal influence, perhaps, but also implies a social factor as teenagers confirm their gender identity and take on more female or male behaviours and activities. And while the newspapers were busy telling us that men and women have different brains, they were also telling us that schools are guilty of gender stereotyping, with few girls learning physics, for instance. When you take these two studies together it suggests that the neurological findings are as a result of what we do in society, rather than it being the other way around. Indeed, many psychologists now believe that the structure and function of the brain has a high degree of social input, starting from before we are born. One year old babies, for instance, can recall music that was played when they were only three-month old foetuses inside their mum’s tum. What we do in the outside world, clearly influences what happens in their internal neural world. But what has all this to do with your website? Well, it is the conundrum of cause and effect. Scientists rarely believe they have proven anything. As the scientific philosopher Sir Karl Popper once said, just because the sun has risen in the East every day you can remember does not mean it will rise in the East tomorrow. There is a strong likelihood that it will, but actually we have no definitive proof that it will ALWAYS do so. The same is true for the human brain. Just because we have one study of brain scans in a limited age range of people from one culture in one point in time does not mean this is what happens in all human brains and neither is it proof that it was always this way. Science is a snapshot. It suggests things, but makes scientists simply eager for more evidence. However, online you find all sorts of claims of “proof” for the way websites work. We are told, for instance, that Pay Per Click advertising is DEFINITELY the quickest way to get high levels of traffic in a hurry. We are told that the ONLY way to get more people on your mailing list is to offer a free item of some kind. And we are told that Google’s algorithm means you MUST do this or that to get a high ranking. But like the science of the brain, these are just snapshots; isolated ideas, frozen in time and space. They may be ideal in one circumstance on one day, but could be completely wrong on another day. So, what do you need to do with your website? You need to treat it as a never-ending scientific experiment. You need to test, re-test and never accept proof of anything. 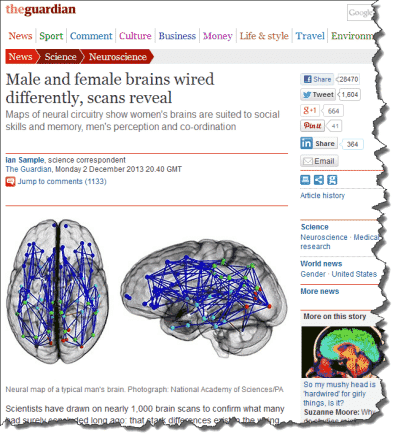 Don’t be fooled by those newspaper reports suggesting we now know that male and female brains are different. The researchers have not turned off their brain scanners and gone home to put their feet up satisfied that after all their hard work they have proven something and they can now just rest. No. They’ll be back in the labs, testing, re-testing, changing their hypothesis and maybe even “proving” that the current “proof” about gendered brains is complete tosh after all. Yet while they are busy doing that, far too many website owners do sit back, rest and assume that they have ticked all the boxes of the “proven” things they need to do. And then they wonder why they don’t work. There is no proof of anything. And certainly no proof that what works on the web today will work on it tomorrow.